In a food processor, blend the first 6 ingredients to coarse puree. With food processor running, slowly and gradually pour in the olive oil. Continue blending until it forms smooth puree. Transfer to a bowl, season with salt. 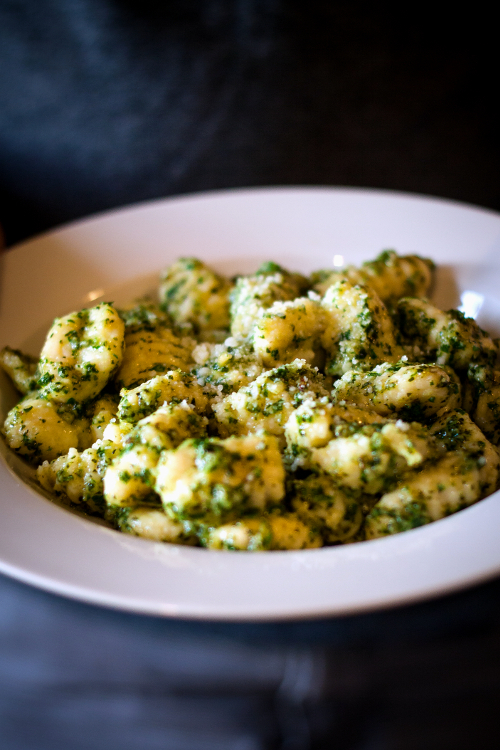 Serve mixed with gnocchis, or your preferred pasta. The signs of fall have not been seen a lot in my part of the world. Here in sunny northern CA the afternoons are still warm, summer dresses are still making appearance everywhere, and our local farmers market are still keeping with their Saturday schedule. Instead of being outside enjoying the last of the summer, I am currently sick with this terrible cough (my chest hurts!). It is very annoying as I can't even finish one sentence without hacking like a mad old woman speaking in tongue. Sickness aside, the offspring still need to be fed. 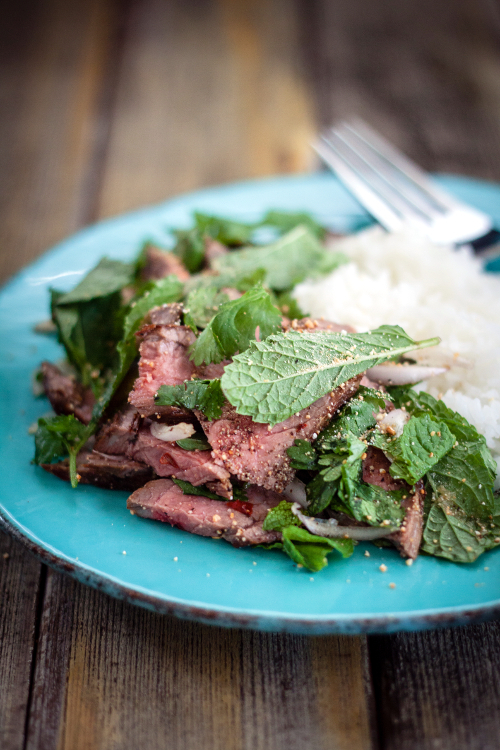 Beef larb is one of the dishes that I can whip up quickly, without sacrificing the quality or the flavors of the meal. It has good balance of heat from the chili, tartness from the lime juice, pungent and saltiness from the fish oil, and nuttiness from the toasted rice powder. And the best part, no trip to the Asian store required. 1. Skirt steak can also be substituted with ground beef. Cook and brown ground beef in a skillet, cool down and mix with the rest of the ingredients. 2. Substitute beef with any meat, like chicken, pork, or turkey. To make the toasted rice powder: Heat a small skillet over medium-low heat, toss the rice into the skillet (no oil), stir constantly until the rice turns golden brown and smell fragrant (about 15 minutes). Cool down a little bit and grind using mortar and pestle until rice turns into coarse powder. Food processor works fine, too. Set aside. Spinkle salt and pepper on both side of the steak. Grill steak to your liking, let sit for 15 minutes and slice thinly. Transfer to a mixing bowl. Add onion, cilantro, mint leaves, fish sauce, lime juice, chili flakes, sugar, rice powder, salt and pepper into the bowl. Toss together to combine, making sure that the beef is well coated with spices and dressing. 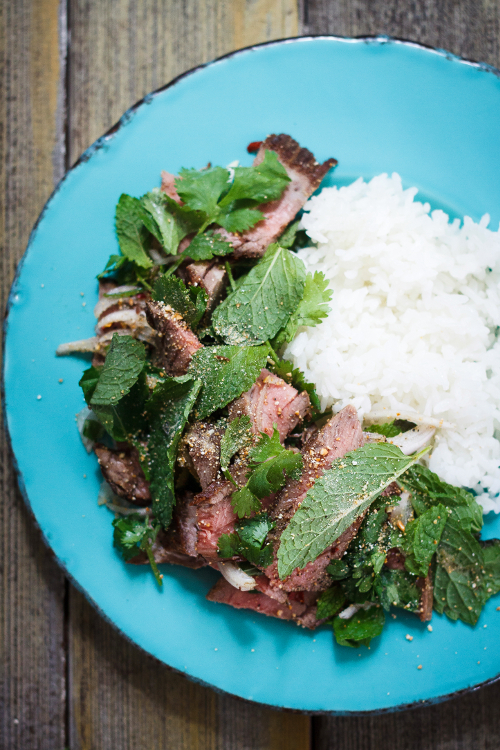 Dish it out onto a plate, serve with cooked sticky rice and enjoy! I am not even going to talk about how long has it been since my last post, it's just downright embarrassing. All I can say is I can't believe how fast time flies, or how much my life has changed in the past year or two. Little C is a freshman in high school (holy smoke!). He's loving it so far! Big C graduated high school last May, and after a short summer break, has started his life at US Naval Academy. It's been quite an adjustment for him, and also for us. Being away from home at (not) college has proven to be a bit challenging for him. Not having him at home makes everything just weird. But I believe eventually all of us will get used to the idea that he's a grown up now, and will have to do grown-up things. Me, on the other hand, find myself with more time in hand than I know what to do with. So back to my true nature, I cook. And I bake. And realized that maybe I need to start posting stuff on my blog again, and get myself busy, before I get bored and decided to move to Annapolis to get closer to big C (J is really against this idea! With good reasons). 4 smoked sausage links, sliced 1/2"
Warm 2 tablespoons of olive oil in a skillet over medium heat. Add sliced sausage into the skillet and cook until brown, stir occasionally. Transfer to a plate and set aside. In a different large skillet, warm the remaining 2 tbsp oil, add garlic and chili flakes. Cook until fragrant and almost brown. Add cherry tomatoes into the skillet, toss until well coated with garlic oil. Cook for about 3 minutes until the tomatoes start to wilt. 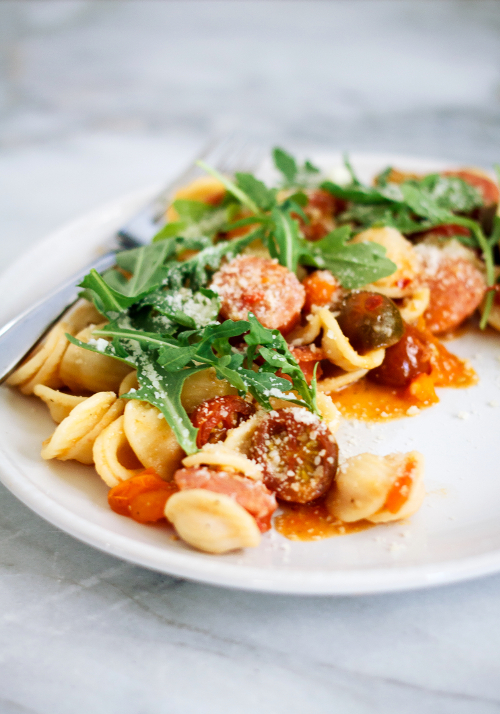 Add pasta, sausage, and pasta water into the skillet, mix until combined. Next, add grated parmesan into the pasta, stir to mix. Season with salt and pepper. Remove the skillet from he heat, gently fold in half of the arugula. 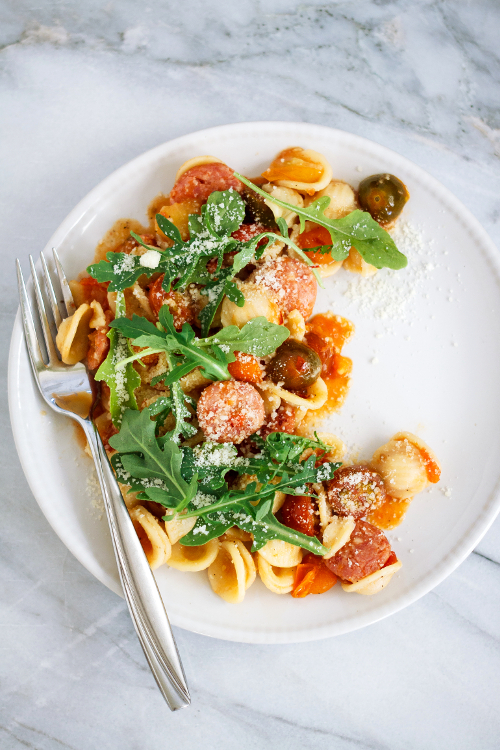 Transfer pasta into individual plates, top with more arugula and sprinkle with more parmesan. Serve and enjoy. 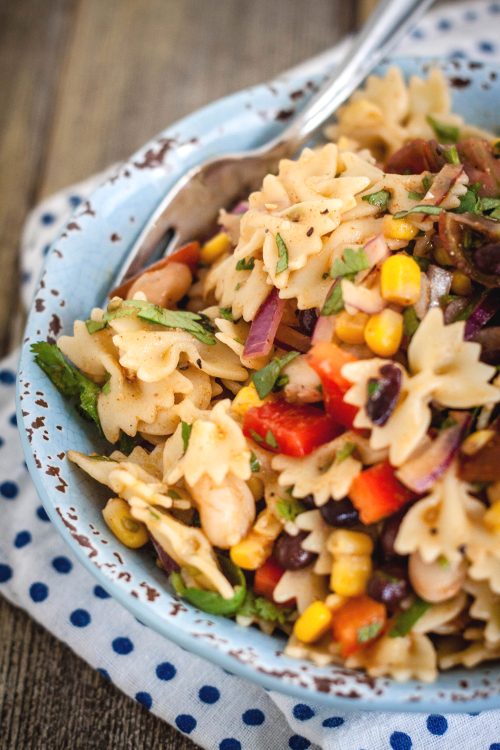 Because if memory serves me right, everybody loves pasta salad. Especially now that the weather is warming up nicely in this good Northern CA. Did I hear someone say picnic? 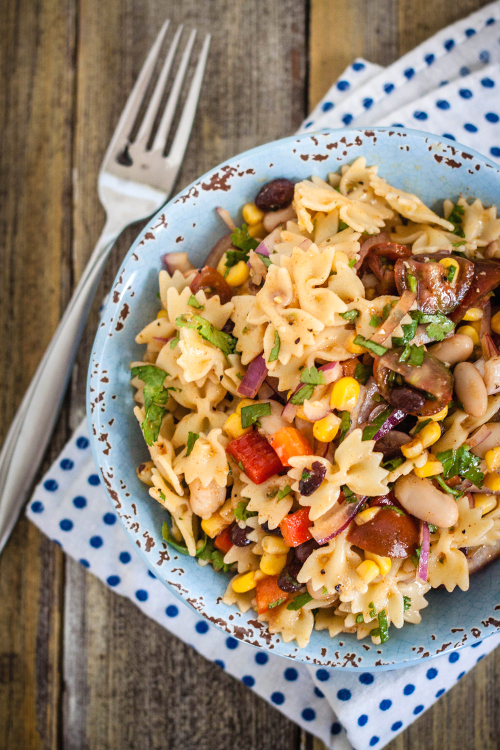 And to be able to bring fresh, zesty, and healthy dish to the table that can be prepared in 30 minutes or less, now that's just the icing on the cake! Place the first 8 ingredients in a large salad bowl. Whisk together oil, lime juice, brown sugar, garlic, chili powder, cumin, salt, and pepper until well incorporated. 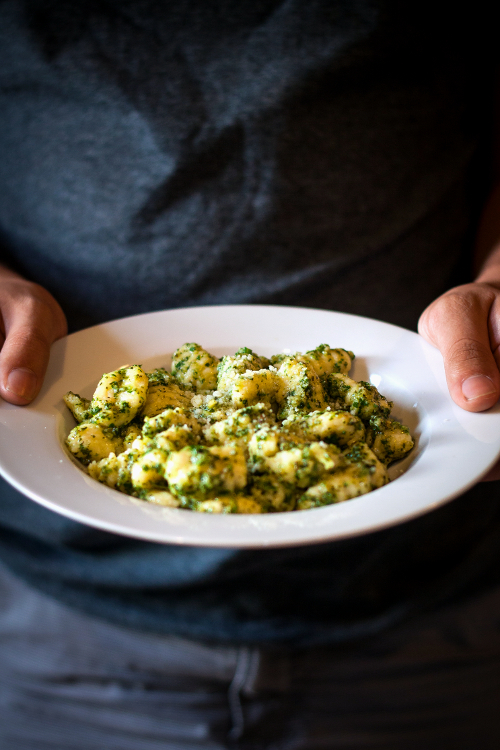 Pour dressing over pasta and vegetables (you might not want to use all of the dressing), toss to combine, serve and enjoy! No, thank you. I don't like tofu you said? Maybe it's because you never had tofu that's cooked right. Cooking tofu is not difficult, and if you follow the steps necessary, you might see them more often on your dining table. After all, it's delicious and it's a great protein that can be enjoyed by everybody. 1. Use the right kind of tofu for the recipe. Depends greatly on what I'm cooking, most of the time I'm using firm to extra-firm tofu because they're easier to handle, hold their shape better, and don't crumble in your hand. You can also diced, sliced, and transform into whatever shape you want. Soft tofu is great for scrambles and stir-fries, while silken tofu is great for baking (try tofu pancakes! ), creamy sauce, and whenever the recipe calls for it (a lot of Chinese and Japanese food use silken tofu). 2. Always, I mean always, press the moisture out of your tofu before cooking. When you buy a package of tofu, it is normally soaked in water. Not pressing the moisture out of them will add extra water to your food, that might result in soggy and watery food. You don't want that! Line a plate with several layers of paper towel, place a block of tofu on top of the paper towels and put a few layers of ore paper towels on top of tofu. Place a plate on top of it, weigh it down with a can or other heavy object. Leave the tofu for a couple of hours, drain the excess water every 30 minutes. 3. Always season your tofu, as tofu sold here is naturally bland. The seasoning part can be done either before or after you paper towel drain the tofu, depending on what your cooking. 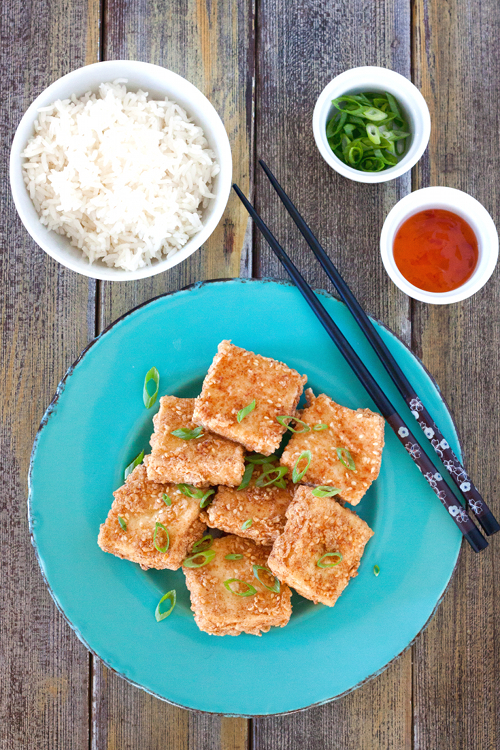 In this recipe below, the tofu is marinated so it absorbs the flavor, then pressed to dry. Or you can also use seasoning rub, or dip into seasoned batter before frying. But nevertheless, add flavors to your tofu, because nobody likes bland food. Pour warm water in a large glass bowl, add salt and minced garlic into the water, mix until the salt is completely diluted. Add tofu into the brine, making sure that the block is completely submerged. Cover with plastic wrap, store in the refrigerator for 8 hours to overnight. Take the tofu out of the salt water, rinse with cold water. Place tofu on a plate lined with paper towels, and put a few layers of paper towels on top of it. Place another plate on top, weigh it down with a can or a heavy bowl. Let the tofu sit for an hour or more, drain the excess water every half an hour. Pat dry and cut into about 16 squares, 1/2-inch in thickness. Heat the oil in a skillet over medium-high heat until it reaches 350 F. Meanwhile whisk the eggs in a bowl and set aside. In another bowl, mix flour, baking soda, sesame seeds, chili powder, coriander, salt and pepper until well combined. Dip tofu squares in egg, dust with seasoned flour, fry until golden brown and crispy. 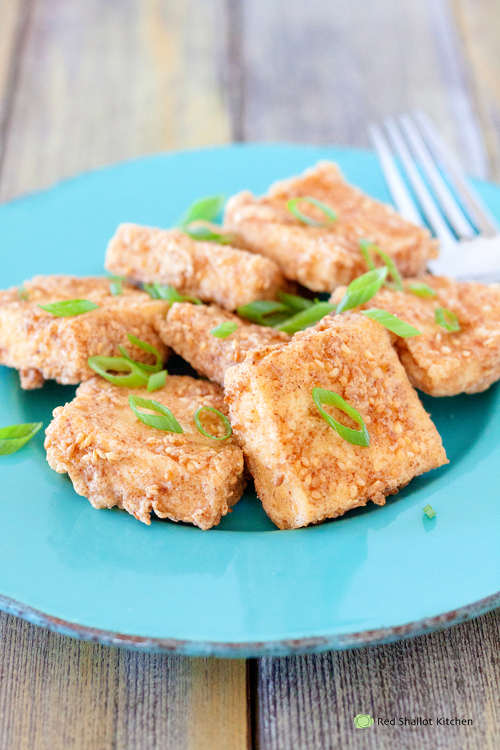 Transfer fried tofu to a plate lined with paper towel to absorb excess grease. Serve hot with sweet and sour dipping sauce, if preferred.